Is It Finally Time to Buy Adobe Systems? Determining if the software giant's post-earnings dip represents a buying opportunity. Shares of Adobe (NASDAQ:ADBE) fell 7% on Dec. 14 after the software company posted its fiscal fourth-quarter 2018 earnings. The company's revenue rose 23% year over year to $2.46 billion, beating estimates by $30 million. Adobe's non-GAAP earnings per share (EPS), which include its acquisition of Marketo, rose 45% to $1.83 per, missing its own forecast by $0.04. But excluding the acquisition of Marketo, that figure would have increased 51% to $1.90 per share to beat expectations by $0.03. On a GAAP basis, Adobe's earnings rose 37% to $1.37 per share. Adobe's report looked solid, but some confusion regarding the Marketo acquisition and the broader sell-off across the market dragged down the stock. Should investors buy the dip in Adobe, which remains up 20% for the year? Adobe makes its money from two core businesses -- the Digital Media division, which houses its Creative Cloud services, and the Digital Experience unit, which provides cloud-based marketing and analytics tools to enterprise customers. Adobe's acquisition of the e-commerce services provider Magento and the business-to-business engagement firm Marketo boosted its Digital Experience revenue this year. During the third quarter, Adobe's Digital Experience revenue grew 25% year over year to $690 million, or 22% excluding Marketo. Adobe's Digital Media revenue, which wasn't boosted by Marketo, rose 23% to $1.71 billion. For the full year (including Magento and Marketo), Adobe's Digital Experience revenue rose 20% and its Digital Media revenue grew 26% against 2017. In fiscal 2019, Adobe expects its Digital Experience and Digital Media revenues to rise 20% and 34%, respectively, and for its full-year revenue to grow 23% to $11.15 billion. It projects non-GAAP EPS growth of 15% to $7.75. Adobe attributed the strong growth of its Digital Media unit to robust demand for its core Creative Cloud products (including Photoshop, Premiere, Illustrator, and Acrobat), which dominate the markets of graphic design, video editing, and document production. Adobe pivoted those products from a license-based model to cloud-based subscriptions in recent years, thus locking in customers and guaranteeing them timely updates. Adobe's Digital Experience revenue grew as its expanding ecosystem of enterprise services attracted big new customers -- including Unilever, Home Depot, and Geico -- during the quarter. Adding Marketo to that ecosystem expands its arsenal of enterprise tools, while the addition of Magento adds additional e-commerce and marketing services. Both acquisitions could help Adobe steal customers away from Shopify (NYSE:SHOP), which is trying to expand its e-commerce services ecosystem with more marketing, payments, and analytics tools. Data source: Adobe quarterly reports. 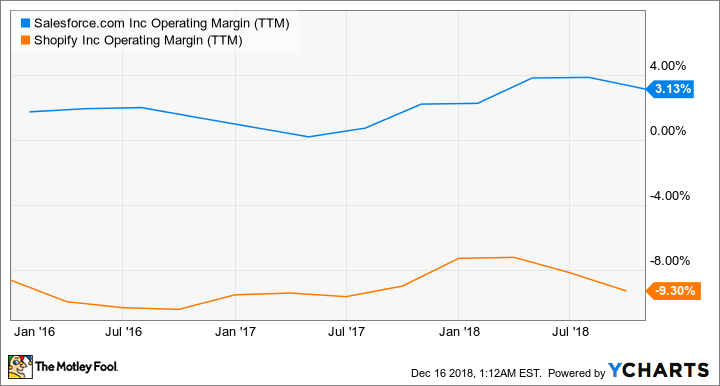 On the bright side, Adobe expects its operating margin to improve sequentially in 2019 (especially in the second half) as it integrates the new businesses. Yet Adobe still retains much higher gross and operating margins than smaller rivals like Shopify, or enterprise cloud service competitors like Salesforce (NYSE:CRM). CRM Operating Margin (TTM) data by YCharts. Adobe also continues to support its EPS growth with share repurchases. The company purchased roughly $2 billion worth of shares during the fiscal year, a strong vote of confidence for a stock that outperformed the broader markets and many of its industry peers in 2018. Is it time to buy Adobe? Adobe's core businesses look solid, its ecosystem is expanding, and its stock isn't too expensive at 30 times forward earnings. Therefore, Adobe is still a great long-term cloud play as it remains more profitable than many of its peers. But investors should nibble on the stock instead of taking on a full position, since the ongoing market correction has been brutal to growth stocks with higher valuations.